The recipe for lemon-cranberry-walnut scones is a variation of a simple one thatâs been around for generations, producing a pastry with a tender texture that's almost crumbly. The lemon flavor is mild, paired nicely with sweet cranberries and bitter walnuts. 1. Preheat the oven to 400 degrees, with a rack in the center. Line a cookie sheet with parchment paper. 2. Combine the flour, sugar, baking powder, grated peel, and salt in a mixing bowl or food processor. Whisk (or pulse) until well blended. Cut the butter into small pieces, add them, and rub the mixture between your fingertips (or pulse) until the butter blends with the rest of the ingredients and the dough looks like coarse meal. If using a food processor, transfer the mixture to a mixing bowl. 3. Stir in the cranberries and nuts until evenly distributed. Add ½ cup half-and-half (or light cream) and the lemon juice and toss with a fork until large, moist clumps are formed and no dry ingredients remain. It may be necessary to add more half and half, a little at a time, to reach this consistency. Dump the dough out of the bowl onto a sheet of waxed paper, knead it very gently a few times, gather it into a ball, divide it in half, and lightly pat each half into a round 6-inches in diameter and 1-inch high. 4. Cut each round into 6 or 8 equal-sized wedges. (To get the best rise as the dough bakes, cut the dough with a sharp knife or a chef’s knife, slicing straight down with a quick motion; don’t saw or wiggle the knife.) Transfer the wedges to the parchment-lined cookie sheet. If you want the edges of the baked scones to be soft, re-make the circle, placing the wedges so their edges touch. If you want the edges of the baked scones to be crisp, separate the wedges by about an inch so air can circulate around them. 5. In a small bowl, make the glaze by whisking the sugar and lemon juice until the sugar dissolves completely. Brush the glaze on the tops of the wedges. Bake until the tops are lightly golden (they won’t brown much because of the glaze) and a toothpick inserted in the middle of one of the scones comes out clean. If you’re baking 12 of them, start checking after about 15 minutes; check earlier if you formed 16 scones. When baked, slide the scones onto a rack to cool. 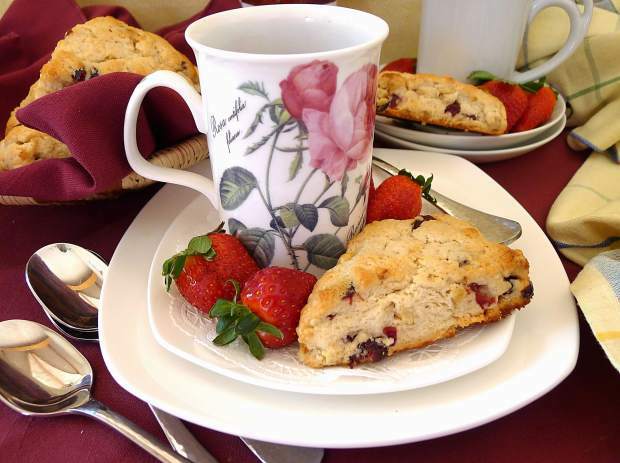 Serve them warm, with butter and jam, or cool completely and freeze, wrapping each scone airtight. Defrost and re-heat in a 325-degree oven until warm to the touch. A high-five to Scotland for giving us scones, the delicious single-serving pastries, similar to a sweetened biscuit, made with berries, nuts and a variety of flavorings. Once they crossed the Atlantic we developed our own version, featuring ingredients readily available in American kitchens. Like their forefathers, our scones are quick-and-easy-to-make and brighten breakfast or elevate a cup of coffee any time of day. This one is a variation of a very simple recipe that’s been around for generations. The pastry’s texture is tender and almost crumbly, the lemon flavor is mild and pleasing, and the sweet cranberries and bitter walnuts contribute nicely contrasting tastes and textures. Use high quality butter and dried cranberries that are soft and flavorful. Spoon and level the flour and don’t overwork the dough if you want the light, lovely texture that’s so important to the scones’ success. Scones are best on the day they’re made, but they freeze well, so either eat them or freeze them soon after baking. Vera Dawson teaches high-altitude baking classes and is the author of two high-altitude cookbooks “Cookies in the Clouds” and “Baking Above It All,” available at The Bookworm in Edwards and Next Page Books and Nosh in Frisco. Her recipes have been tested in her Summit County kitchen and, whenever necessary, altered until they work at our altitude. Contact her at veradawson1@gmail.com.